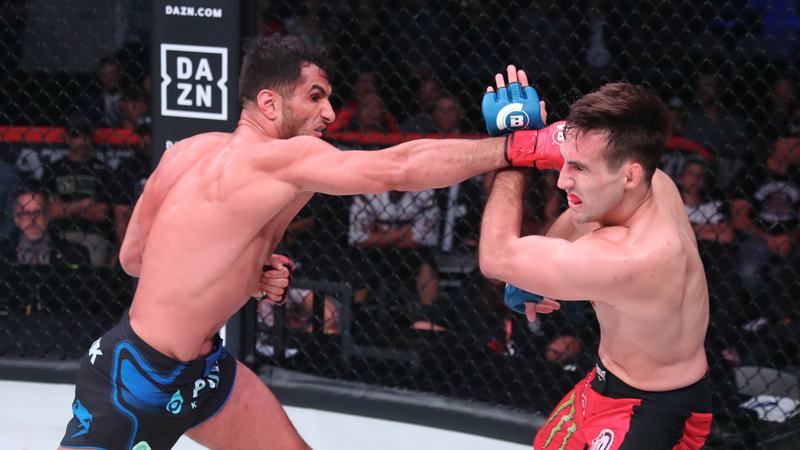 The Bellator 206 main event between middleweight champion Gegard Mousasi and welterweight titleholder Rory MacDonald had been deemed as arguably the biggest fight in Bellator history entering Saturday night. And when it was over, “The Dreamcatcher” made sure that the superfight ended in a nightmare for MacDonald. Mousasi made it look easy, running through and thoroughly outclassing MacDonald, before winning by TKO at 3:23 of the second round to retain the middleweight title. After Mousasi dominated the first round, MacDonald (20-5) tried an Immanari roll, in which he shot after Mousasi’s leg in attempt to get him to the ground. Mousasi saw it coming a mile away, grabbed MacDonald’s leg, dropped down and started pummeling his opponent with some of the most vicious ground-and-pound punches you will ever see, as he shattered the Canadian’s nose in the process. MacDonald tried to give up his back a couple times, but Mousasi kept pouring it on with a flurry of punches and elbows until referee Herb Dean had finally seen enough and stopped the fight. So, what’s next for “The Dreamcatcher?” After mentioning the keys to his victory over MacDonald, Mousasi made his future plans clear by calling out Rafael Lovato Jr. and Lyoto Machida. Lovato is coming off an impressive third-round submission victory over John Salter at Bellator 205 on Sept. 21. The win helped established him as the clear-cut No.1 contender. He’s undefeated in nine fights with eight of those wins coming by stoppage. In addition to Lovato, Mousasi also pointed out that he would like another crack at Machida, who makes his promotional debut in December against former middleweight champ Rafael Carvalho. Mousasi and Machida battled in February 2014 at UFC Fight Night 36 and the former UFC light heavyweight champion walked away with a narrow unanimous decision victory. But in 2016, before his scheduled bout against Dan Henderson, Machida admitted to taking a banned substance and wound up being suspended for 18 months by the United States Anti-Doping Agency. Ever since then, Mousasi feels like Machida was cheating when they fought. If they do end up clashing again, Mousasi wants stringent testing to ensure Machida would be fighting clean. The likely scenario, as long as everyone is healthy, is that Mousasi and Lovato would take place in early 2019 and if Machida gets by Carvalho, he would face the winner in late spring. Until then, fight fans can savor Mousasi’s Bellator 206 performance. As Mousasi and MacDonald stared each other down before the opening bell, Mousasi’s size advantage was evident. And that translated to the action immediately, as Mousasi (45-6-2) set the tone as the aggressor and never let up. The middleweight kingpin established distance and kept snapping MacDonald’s head back with hard jabs. His inside leg kicks started to take their toll on MacDonald’s left leg as well. MacDonald had moments where he would get some punches in, but couldn’t truly answer the punishment Mousasi was dishing out. Going for Mousasi’s leg during the second round had MacDonald caught in a firestorm of ground-and-pound punches and elbows that ended the fight emphatically. Here was our live coverage of Bellator 206. 1:05 a.m.: Round 1 to Mousasi (10-9). Can see the size discrepancy right away. Mousasi looks to be about 15 pounds heavier than MacDonald. The name of the game for the middleweight titleholder was the jab. He nailed a stiff jab on more than one occasion and kept snapping MacDonald’s head back. MacDonald needs to find an answer in a hurry. He cannot take those for another four rounds. 12:58 a.m.: It’s time for the main event of Bellator 206 as Gegard Mousasi defends the middleweight championship against welterweight champion Rory MacDonald. Mousasi captured the middleweight title by beating Rafael Carvalho via first-round TKO at Bellator 200 in May. He enters Saturday night on a roll, having won seven consecutive bouts, including both of his Bellator contests. MacDonald, who will also be in the welterweight tournament, won the welterweight crown by notching a unanimous decision victory over Douglas Lima at Bellator 192 in January. “The Red King” has also won both of his Bellator outings heading into the biggest fight of his career. Should be a fantastic main event and could live up to its billing as: The biggest fight in Bellator history. 12:46 a.m.: Jackson def. Silva by TKO at 4:32 of the second round. A better-than-expected clash between MMA legends. Jackson and Silva went toe-to-toe for the entire first round with Jackson owning a slight advantage. Silva walked back to his corner and told them he couldn’t breathe. And it showed. His punches looked slow and the movement wasn’t there. It would be a matter of time before “Rampage” finished Silva off. And Jackson did exactly that, connecting on left hook followed by an overhand right hand to send Silva packing to the canvas. Jackson blasted “The Axe Murderer” with a series of ground-and-pound punches and the referee stopped it to even their rivalry at 2-2. The win snaps a two-fight losing streak for Jackson, as he earns his first victory since June 2016. 12:36 a.m.: Count me among those who are surprised this has gone past the first round. And the opening frame was quite entertaining. Jackson and Silva each landed a couple of hard right hands, but Jackson’s were the heavier punches and inflicted the most damage. Silva cannot win a fire fight. He needs to mix things up and use his knees to confuse Jackson. 12:25 p.m.: It’s time for the co-main event of Bellator 206: Quinton “Rampage” Jackson squares off against Wanderlei Silva in heavyweight action. Silva won their first battle by first-round TKO at Pride Final Conflict in November 2003 and the rematch by second-round knockout at Pride 28 in October 2004. In the trilogy bout, a little more than four years later in December 2008 at UFC 92, Jackson (37-13) won by first-round KO. Who will get the latest laugh inside the Bellator cage? Don’t get up to use the bathroom or grab some refreshments. This match won’t last long. 12:15 a.m.: Lima def. Koreshkov by submission (rear-naked choke) at 3:04 of the fifth round. The leg kicks of Lima set the tone and had a huge effect on Koreshkov. He couldn’t figure out what to do and how to put any pressure on Lima. Even though he had the bout well in hand, Lima surprisingly took the fight to the ground. But no worries, as Lima had Koreshkov right where he wanted him. When Koreshkov tried to adjust his body, Lima effortlessly took his back, sunk in the choke and Koreshkov passed out. Just like that, Lima advances to the semifinals to take on the winner of Paul Daley vs. Michael Page in 2019. 12:06 a.m.: Heading into the final round, I have Lima up 3-1. Continuous leg kicks and mixing up his striking is giving Koreshkov all types of problems. An overhand right near the end of the fourth staggered Koreshkov, who needs a stoppage. 11:59 p.m.: UFC light heavyweight and heavyweight champion Daniel Cormier is in the building. Great to see fighters from other organizations giving fellow fighters their respect. 11:52 p.m.: Love the game plan of Lima after two rounds. He’s making mince meat of Koreshkov with thunderous leg kicks. Koreshkov needs to get it in the clinch and to the canvas. He doesn’t have the power to put any fear in Lima. 11:43 p.m.: For those who don’t know, each fight in the grand prix is a five-round affair. That many rounds will truly determine who the better man is. 11:36 p.m.: Now at Bellator 206, in the first round of the welterweight grand prix, Douglas Lima takes on Andrey Koreshkov in a trilogy fight. They are 1-1 against each other. Lima is a two-time welterweight champion, but lost his title in his last outing to Rory MacDonald at Bellator 192 this past January. Since he lost the belt to Lima, Koreshkov has won back-to-back fights. Great way to kick off the tournament. 11:20 p.m.: Pico def. Higo by TKO at 3:19 of the first round. A fantastic performance. It became obvious from the jump that the fight would end by knockout as Higo and Pico were trading heavy artillery. Pico mixed it up by starting to use kicks to help set up his punches. The former Golden Gloves boxing champion sent Higo packing by dropping him with a vicious overhand right. Then, Pico went to work with hard shots to the body and head, while Higo wasn’t defending himself. Pretty shameful the referee was out of position because the fight should have ended after four punches into that barrage. Higo shouldn’t have had to be knocked out from a standing elbow, stumble to the ground and get blasted with another shot for the fight to end. Still, it was the best win of Pico’s career. He showed he’s for real and lived up to the hype as the best prospect in the sport. 11:13 p.m.: Coming up at Bellator 206, Aaron Pico battles Leandro Higo in featherweight action. Since losing his debut last year to Zack Freeman, Pico has won three consecutive bouts, all coming by stoppage. But this is without a doubt the toughest test for the 22-year-old, as Higo is a 22-fight veteran. Will Pico shine or does Higo spoil the upstart’s party? 10:56 p.m.: Melendez def. Zimemrman by split decison (29-28, 28-29, 29-28). Better-than-expected fight. Zimmerman showed more than many expected by using her grappling attack to fluster Melendez. The wife of former Strikeforce lightweight champion, Gilbert Melendez, showed great striking by continuously pounding Zimmerman’s body and then going upstairs. A close battle, but the judges got it right. If Zimmerman shows improved striking — combined with her jiu-jitsu — watch out because the talent is there. Melendez remains undefeated through three pro fights. 10:44 p.m.: Highly-entertaining first round. Melendez was superior with her kicks and elbows in the upright position. But Zimmerman nearly finished Melendez by catching her in a triangle, transitioning to an armbar. Thankfully for Melendez, the round came to a close. 10:35 p.m.: Up next at Bellator 206, Keri Melendez takes on Dakota Zimmerman. Melendez has won both of her fights since transitioning to MMA from kickboxing. Should be a cakewalk for Melendez. 10:26 p.m.: Bolanos def. Gutierrez by knockout at 1:37 of the second round. Great performance from Bolanos. The fight came to end when Bolanos clipped Gutierrez with a left hook right above the ear. Bolanos quickly took Gutierrez’s back and connected on a series of left and right hands to finish it off. All four of Bolanos’s wins have come via stoppage. 10:13 p.m.: Kicking off the main card at Bellator 206 are featherweights Gaston Bolanos and Ysidro Gutierrez. After suffering the first loss of his career, Bolanos has won back-to-back fights. Gutierrez comes in having won two of his last three bouts. Young prospects starting this evening’s festivities. 10:09 p.m.: Two things I like about the broadcast coming out of the gate. You have a backstage crew that are in the locker rooms and the analysts inside the arena. Makes the card feel bigger. 10:02 p.m.: The main card is about to begin. Like how Bellator has the key fighters on the show come on the stage and have a staredown. Gives each fight a bigger feel. 9:48 p.m.: Piccolotti def. Terry by unanimous decision (30-27, 30-27, 29-28). Have to be impressed with Piccolotti. The way he worked the jab was a thing of beauty. He worked everything off of that and you can see how effective it was, as Terry’s face was a bloody mess. Give Terry credit for hanging tough and never giving up, though. After suffering back-to-back losses, the 30-year-old Piccolotti has now pulled off two straight wins. 9:35 p.m.: Piccolotti’s pace is starting wear on Terry. Only a matter of time before Piccolotti finishes him off. 9:32 p.m.: Terry is throwing bombs and trying to put Piccolotti away, while Piccolotti is methodical and chopping him down to the body and then going up top. Smart strategy. 9:26 p.m.: In the headlining fight of the Bellator 206 prelims, James Terry battles Adam Piccolotti at a catchweight of 160 pounds. 9:24 p.m.: Bell def. Costa by submission (armbar) at 3:06 of the second round. Slick submission by Bell. He rolled Costa over, locked in the arm and rolled onto his stomach, with Costa immediately tapping out. Bell has now won the first two fights of his career. Like how Bellator showcases the fighters who live in the area. Common sense as it helps sell more tickets. 9:11 p.m. : Right now at Bellator 206, Cass Bell faces Ty Costa in bantamweight action. 9:09 p.m.: Blencowe def. Leibrock by TKO at 1:23 of the third round. Very good striking battle. The end of the fight triggered memories of “Rampage” Jackson power bombing Ricardo Arona in Pride back in 2004, when Blencowe picked Leibrock up and slammed her to the ground. Leibrock’s head bounced off the mat. A few ground-and-pound punches later and the fight was stopped. Impressive move and a great finish. 9:02 p.m.: Excellent striking battle thus far. Blencowe is connecting on the crisper shots from distance. 8:51 p.m.: Coming up at Bellator 206, Arlene Blencowe faces off against Amber Leibrock in women’s feattherweight action. 8:49 p.m.: Labiano def. Smitley by TKO at 3:28 of the first round. All Labiano from the opening bell. Smitley had zero answers for the striking of Labiano. None. Labiano dropped Smitley and pounded him out for the victory. The native of California has now won three of his last four matches. 8:41 p.m.: Up next at Bellator 206, Justin Smitley takes on Jeremiah Labiano in featherweight action. 8:39 p.m.: San Diego def. Neal via split decision (28-29, 30-27, 29-28). Both guys left it all there, but it came down to that late takedown by San Diego to lock up the victory and snap his three-fight losing streak. 8:32 p.m.: San Diego is a bloddy mess. Can he muster a rally in the final two minutes? 8:26 p.m.: Anybody’s fight heading into the third and final round. 8:16 p.m.: The undercard of Bellator 206 is underway with Joe Neal clashing with Josh San Diego in bantamweight action. 7:30 p.m.: Gegard Mousasi, Rory MacDonald, Rampage Jackson and Wanderlei Silva tip the scales to make their respective fights official for Bellator 206. – Gegard Mousasi tells Sporting News that facing Rory MacDonald is potentially MMA’s biggest superfight. – A lot of big fights have taken place inside the Bellator cage. SN ranks the biggest of them all. – SN takes a look at one of Bellator’s top prospects . – A look at Rory MacDonald’s journey from the protege of Georges St-Pierre to possible two-division world champion. – 50 Cent to hand out a large sum of money to the winner of the Bellator welterweight grand prix. – What will a victory at Bellator 206 do for Aaron Pico ? – Mousasi explains to SN how facing MacDonald is just another world title fight.